^ Kagan, Donald. The Fall of the Athenian Empire. First. Ithaca, New York: Cornell University Press, 1987. Brun, Jean. Socrate sixth. Presses universitaires de France. 1978: 39–40. ISBN 2-13-035620-6 （法语）. 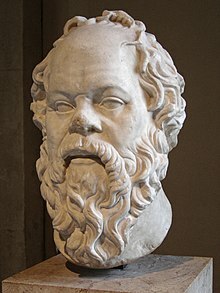 Coppens, Philip, "Socrates, that’s the question" Feature Articles – Biographies, PhilipCoppens.com. May, Hope. On Socrates. Belmont, CA: Wadsworth. 2000. ISBN 0-534-57604-4. Ong, Walter. Orality and Literacy. New York: Routledge. 2002. ISBN 0-415-28129-6. Pausanias, Description of Greece. W. H. S. Jones (translator). Loeb Classical Library. Cambridge, MA: Harvard University Press; London, William Heinemann Ltd. (1918). Vol. 1. Books I–II: ISBN 978-0-674-99104-0. Vol. 4. Books VIII.22–X: ISBN 978-0-674-99328-0. Vlastos, Gregory. Socrates, Ironist and Moral Philosopher. Ithaca: Cornell University Press. 1991. ISBN 0-8014-9787-6. Bruell, Christopher (1999). 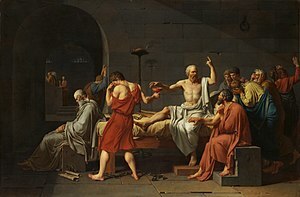 On the Socratic Education: An Introduction to the Shorter Platonic Dialogues. Lanham, MD: Rowman and Littlefield. An Introduction to Greek Philosophy, J. V. Luce, Thames & Hudson, NY, l992. Greek Philosophers—Socrates, Plato, and Aristotle, C. C. W. Taylor, R. M. Hare,和Jonathan Barnes, Oxford University Press, NY, 1998. Taylor, C. C. W. (2001). Socrates: A very short introduction. Oxford: Oxford University Press.